First published in 1946, the scope of H.W. 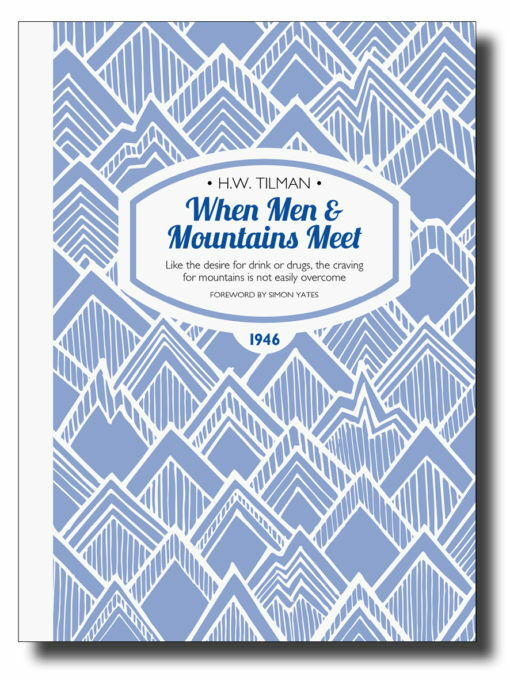 ‘Bill’ Tilman’s When Men & Mountains Meet is broad, covering his disastrous expedition to the Assam Himalaya, a small exploratory trip into Sikkim, and then his wartime heroics. And then, in 1939, war breaks out. With good humour and characteristic understatement we hear about Tilman’s remarkable Second World War. After digging gun pits on the Belgian border and in Iraq, he was dropped by parachute behind enemy lines to fight alongside Albanian and Italian partisans. Tilman was awarded the Distinguished Service Order for his efforts—and the keys to the city of Belluno, which he helped save from occupation and destruction. Tilman’s comments on the German approach to Himalayan climbing could equally be applied to his guerrilla warfare ethos. ‘They spent a lot of time and money and lost a lot of climbers and porters, through bad luck and more often through bad judgement.’ While elsewhere the war machine rumbled on, Tilman’s war was fast, exciting, lightweight and foolhardy—and makes for gripping reading. There are few people who truly deserve the title ‘legendary’, but Harold William Tilman certainly does, being both one of the greatest mountaineer-explorers of his time and arguably the best expedition writer ever. In an age obsessed with celebrity, where every banal action is recorded on social media, Tilman comes along as a welcome antidote—his lifetime of extraordinary adventure and achievement recorded in sparse prose, laced with gentle irony, dry humour and timely quotation. Simon Yates is an internationally acclaimed mountaineer, adventurer and author. In a prolific career spanning over thirty years, Simon’s climbing adventures have taken him west to east, from Alaska to Australia; and from north to south, from the Canadian Arctic to the tip of South America. He is the author of three books: Against the Wall, The Flame of Adventure and The Wild Within. When not writing and lecturing he runs his expedition company, Mountain Dream. ISBN 978-1-909461-22-2; 216 x 156mm, 260 pages, photos, maps. Softcover with sewn binding, cover flaps and matt lamination.